What Is the Difference Between an Eyelet and a Grommet? The difference between eyelets and grommets is actually a subtle one. The ratio between flange diameter and hole size tends to be a bit larger in grommets, allowing their larger flanges to grip more surface area on the material into which they are set. For more information on eyelet and grommet measurement and terminology, please read this article. Some customers feel that an eyelet flange is more attractive than a grommet’s and choose their part according to their aesthetic preference alone. As mentioned above, the larger-flanged grommet is often preferred when set in a flexible material, such as flags and tarps, while eyelets tend to be the preference in harder materials such as plastics and metals. 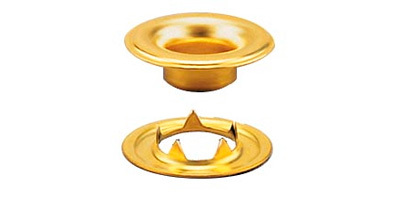 There is also a common misconception that grommets consist of two pieces (the grommet and washer). However, this is not the case, despite the fact that grommets are normally sold as a grommet and washer set. 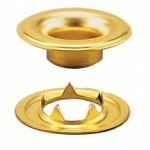 A handful of customers may use a grommet without a washer, while others will employ a washer with their eyelets. Additionally, grommets are theoretically sized using industry standards (e.g. #00, #0, #1 etc. ), whereas eyelets are dimensionally non-standard in the context of the industry as a whole. These standard grommet designations originated decades ago when the United States government adopted them based on Stimpson’s own product line. Over the years, however, different manufacturers have veered from these standards and, as a result, trade size no longer necessarily translates to dimensional compatibility between manufacturers. 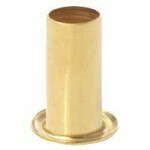 In short, whether you choose an eyelet or a grommet depends upon your particular application.